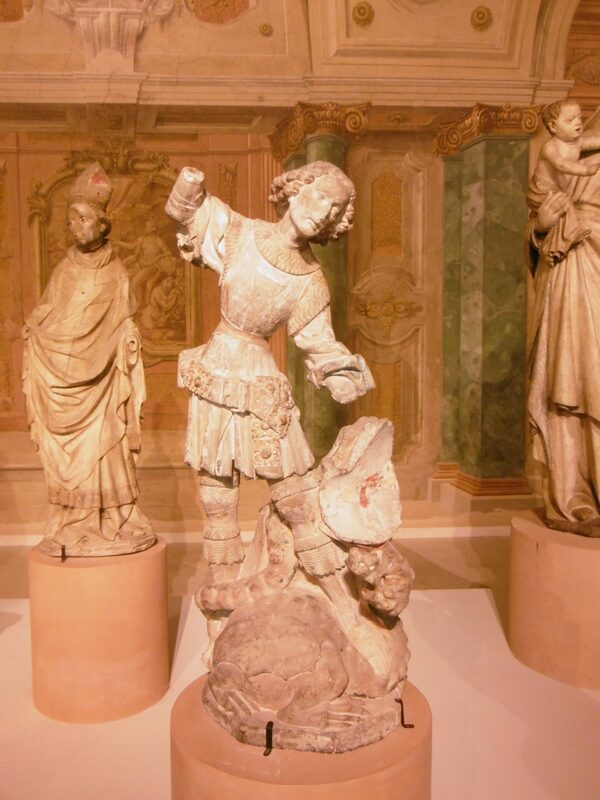 The St. George from Großlobming, Styria, in the Belvedere, Wien. If you make your way to the Belvedere in Vienna, grumble at the steep price for tickets and gawk at the splendid, arrogant promenade sloping down towards the city centre and the lower pavilion, you will find yourself in the marble lobby of the Upper Belvedere. On the upper floors they have the Napoleon Crossing the Alps by David, some colourful paintings by Gustav Klimt, and a lot of softcore nudes for lonely Victorian gentlemen, but the most magnificent work is in a little suite of rooms on the ground floor opposite the gift shop and the cafe: a collection of statues from a little village church in the hills of Styria. I could talk about each of them, but because this blog is what it is, I will focus on the St. George. Take a few moments to take him in: the expressive arms, the long slender profile with a high narrow waist and a deep rounded chest, the ethereal, emotionless face as he places his lance just right … some of the best things about Latin Christian art at the end of the 14th century in one statue. The little church does not have records of when it was redecorated, so when he was made can only be guessed at: probably sometime within 20 years of 1380. The weapon bearer from the relief of the North Staircase, Apadana, Persepolis courtesy of Jona Lendering of Livius.Org.